The benefits for disabled adults and the elderly that are included in Proposal 4 are either already being provided or can easily be provided without amending the constitution. The proposal contains no new options for care recipients, no new programs for care recipients, no new avenues for taxpayer savings and no new provisions for improved care for recipients. There has been no threat to the Medicaid-financed in-home care program. Moreover, there has been only one threat to the ancillary programs for training, registry and background checks: the dubious unionization of in-home caregivers and the collection of more than $30 million in union dues from Medicaid money meant for those caregivers. The subsequent public outcry and legislative backlash against the SEIU and the MQC3 for this arrangement led to the defunding of the MQC3. Advocates serious about these programs should consider severing them from unionization, rather than chaining them together, as Proposal 4 does. 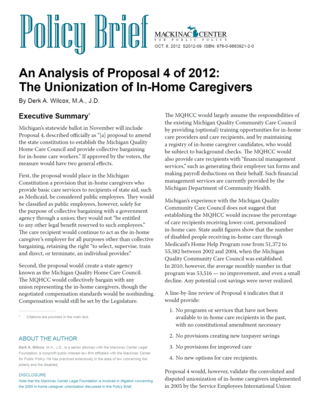 Proposal 4, in truth, would serve primarily to validate the unorthodox and illegal unionization of in-home caregivers that has already occurred. It would grant legitimacy to the model of public-sector unionization in which anyone who receives money indirectly from a government program is a government employee subject to collective bargaining and union dues and agency fees.